Though I typically reserve my bi-monthly column to issues, updates, and opportunities that directly relate to Grand Canyon National Park, I can’t resist giving a shout out to a newly-minted outdoor education program just a few hours down the road. The Petrified Forest Field Institute (PFFI) will be providing expert-led, hands-on learning adventures to visitors of Petrified Forest National Park (PEFO) beginning in August. 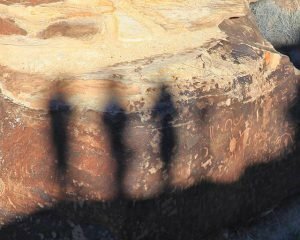 This collaboration between the National Park Service and PFFI’s parent nonprofit, the Petrified Forest Museum Association, will offer an amazing array of classes for people of all interests and hiking abilities. PFFI is just the latest example of PEFO Superintendent Brad Traver’s ongoing efforts to transform the park into a household name in the tradition of Grand Canyon, Lake Powell, and Monument Valley. With the launch of PFFI, the recent expansion of PEFO’s boundaries, new and upgraded park exhibits and amenities, and a more welcoming spirit for those wishing to get off the beaten path, the time is right to visit this magnificent park for the first time, or perhaps fall in love with it all over again. In my capacity as the director of the Grand Canyon Field Institute, and in light of my familiarity with PFFI’s talented and growing instructor team, I can give a rousing endorsement for the “new kid on the block” when it comes to the breadth and quality of PFFI’s class offerings. Find out more by following this link: Petrified Forest Field Institute (PFFI).